Created to order, these gorgeous bespoke prints are created and dispatched within 2-3 working days. "This personal contact is so refreshing - thank you. It's one of the best, most personal service I've ever come across - so human! All the best with your business and I'll be sure to recommend you to my friends." About your Print: Your artwork will be created to order and printed onto very high quality gloss finish paper stock. It will be posted with a backing board and smooth white finish bevel cut mount, and will be attractively presented sealed in a protective crystal clear presentation sleeve. Your print will be posted in a strong hard backed envelope and will require a signature on delivery. The overall size of the mount is 10"x8" and will fit into any standard 10"x8" picture frame. 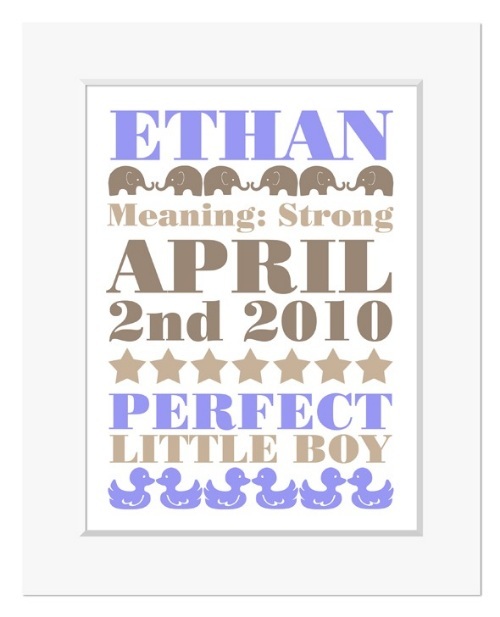 How to Order: In most designs, the prints feature the child's first name, followed by the meaning and date of birth. 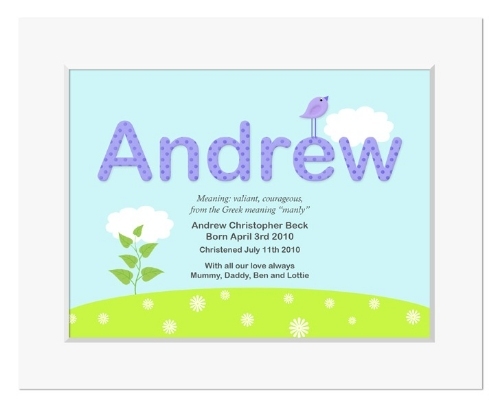 Many designs can also feature the child's full name, the date of the Christening or naming ceremony, and a special personal message. Take a look at the designs for information about the wording that can be included. When you are ready to order, simply provide your chosen wording by entering the details in the box provided on the Order Form. Please ensure all spelling and dates are correct as mistakes cannot be rectified once your print has been produced. Please don't use all capitals. If you would like to see a proof before it is printed, please state this clearly in the box (a proof will be sent to you within 2 working days and the print will not be made or dispatched until you have approved the artwork). Delivery: The price includes delivery within the UK, and your print will be posted via 1st class recorded (signed for) delivery. Please allow between approximately 1-2 working days for delivery. A lovely fresh design with a seaside theme, perfect for both boys and girls. 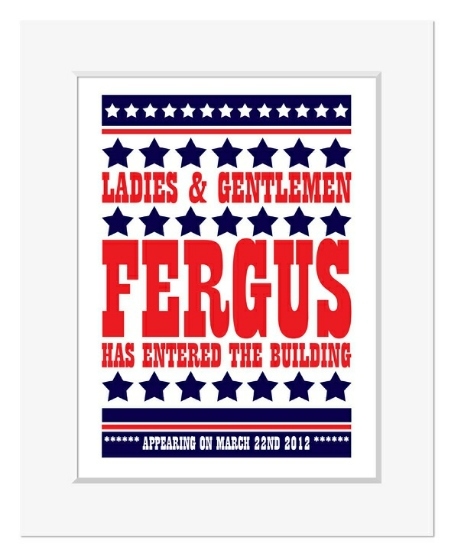 The design has a soft blue background with features picked out in red, white and blue. A fresh, contemporary design in a crisp blue-grey - ideal for a modern, stylish nursery, and perfect for a Scandi or Nordic themed room. 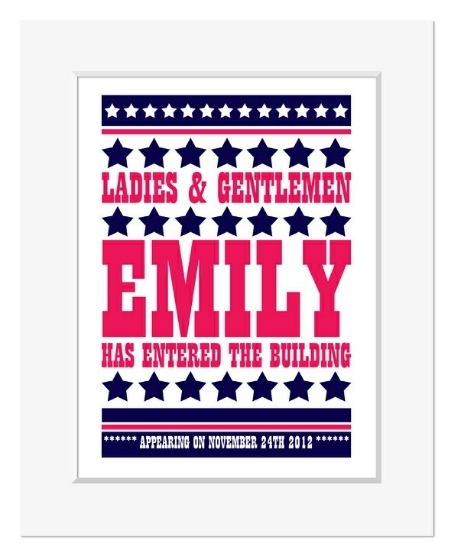 This lovely personalised print is available with either soft pink or blue features. A lovely traditional style print with a folk-art storybook feel, in deep yellow and grey which works beautifully for both boys and girls. 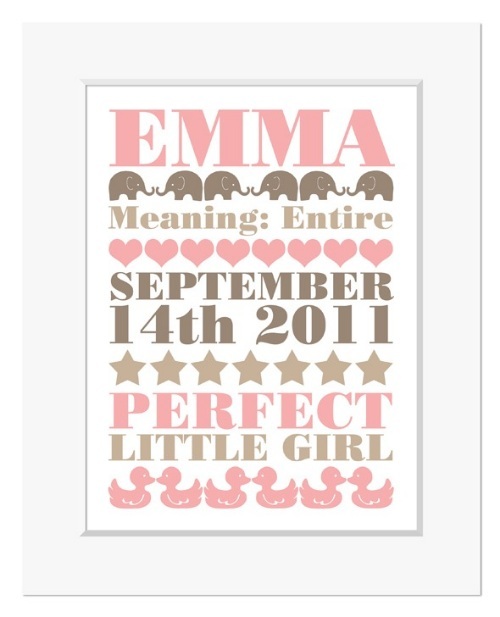 A pretty pink print that will look lovely in a little girls bedroom or nursery. The design features the wording 'sugar and spice and all things nice', and is personalised with the child's first name and its meaning, and the date of birth. A lovely blue print that will be a delightful finishing touch in a little boys bedroom or nursery. The design features the wording 'slugs and snails and puppy dog tails', and is personalised with the child's first name and its meaning, and the date of birth. 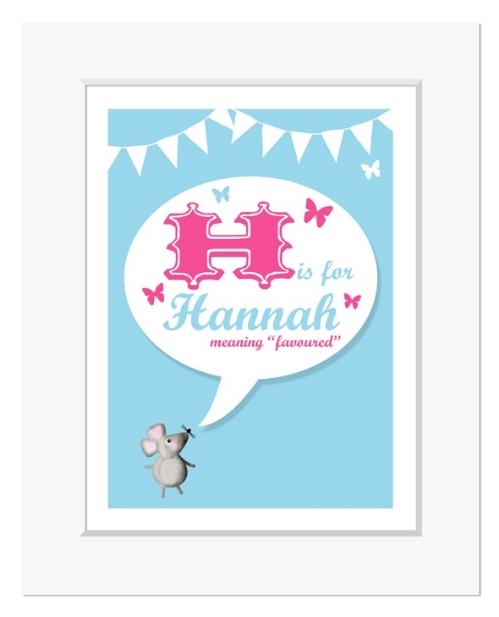 A sweet print available in pink or blue, featuring digitally hand-coloured images illustrating each letter of the child's first name. A fresh, contemporary monogram design available in a choice of four colours. (If you would like the print in a different colour to those shown, just let me know by adding your request in the 'special instruction' space on the payment page.) Ideal for a baby or an older child, this contemporary design will work equally well in a nursery or child's bedroom. 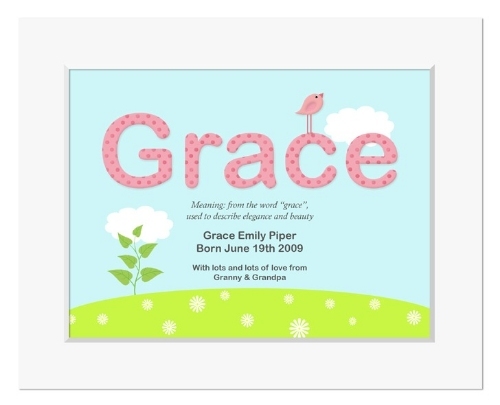 A perfect christening or birthday gift for your little one. A lovely print with a pale blue background and a simple, retro feel. Available with a choice of either pink or green highlights. A truly sweet print available in pink or blue. 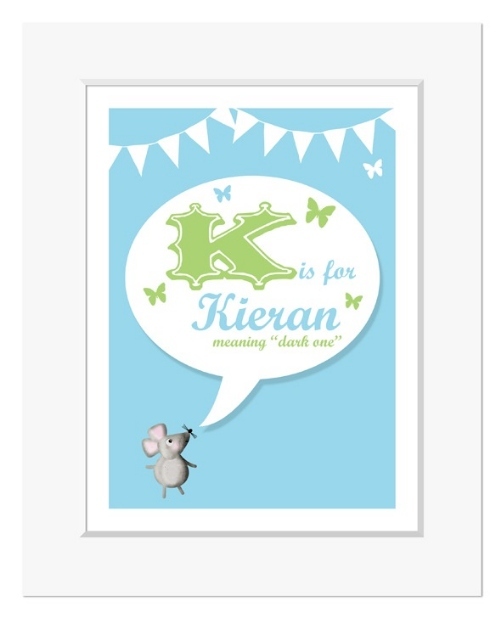 Featuring playful little mice, this personalised print includes the child's full name, name meaning, and date or birth, as well as an optional personal message. A bright and cheerful print available in pink or blue. Perfect for a spring or summer baby! 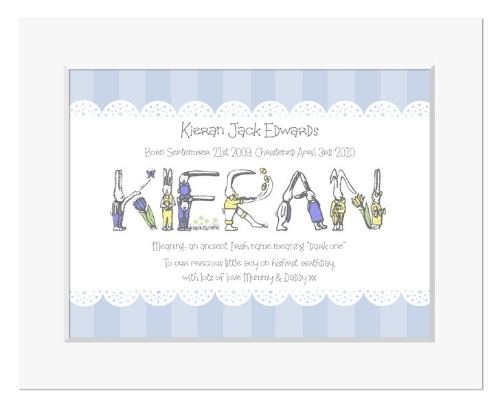 The design is personalised with the child's name and it's meaning, their date of birth and christening/naming ceremony (optional), and an optional personal message too. This delightful design has an elegant traditional feel, and features lots of important statistics about your baby's birth. Shown in blue, pink or soft sage green, you are also welcome to request your own custom colour to suit your nursery decor and I'll be more than happy to create it for you - just pop your request in the 'special instructions' space on the payment page. This design features the words "our perfect little boy/girl" - however this can also be adjusted to suit. Perfect Little Boy/Girl Wording: 'Our' or 'My'? This adorable little hare will look charming in your little one's nursery or bedroom! Beautifully illustrated, this sweet personalised print has a beautiful textured effect finish adding to the traditional charm of this lovely design. Perfect for a little boy or girl. 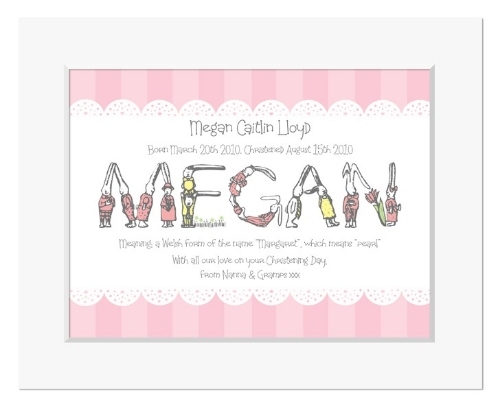 A sweet print available in pink or blue, featuring digitally hand-coloured bunny rabbits illustrating the letters of the child's first name. A truly lovely design, ideal for a spring or Easter baby! 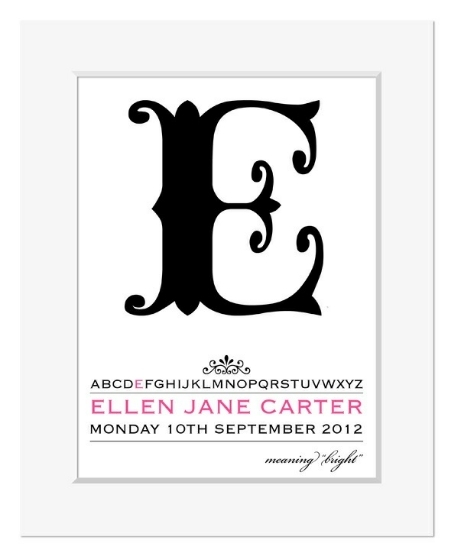 A pretty personalised print available in soft neutral shades and a choice of either pink or blue touches. A simple, elegant typographic design in a smart monochrome style. This timeless theme is personalised with your child's full name, name meaning, and date of birth. This smart print will look great in both a traditional or contemporary style room. Such a pretty design, in fresh bright pale blue and white. 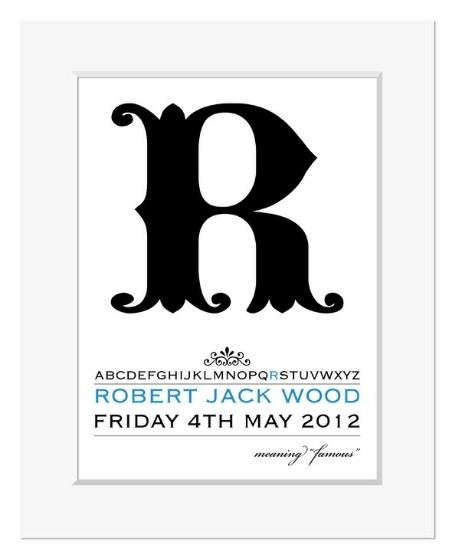 This design is personalised with your child's first name and it's meaning, along with details of their birth. Available in either pink or blue options. A lovely jolly nautical themed design, featuring a friendly whale and his little goldfish friend! In shades of blue and white, this delightful print will look lovely in a little boy or girl's room.